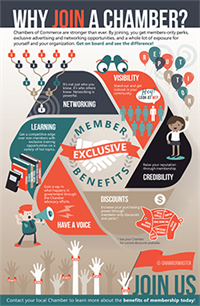 A FREE infographic for you to use to market your Chamber. The ChamberMaster team came up with the top 6 benefits of joining a Chamber and included them in an eye-catching layout your Chamber can use in its marketing efforts. Download our most popular infographic now. Its unbranded, generic design is ready for your Chamber to use as-is. Or feel free to add your Chamber’s logo and website address. This complimentary infographic is our gift to you and it’s the perfect addition to your recruiting tool-kit. Share it on social media, post it on your website, or send it to prospective members. Get a copy for your Chamber now.